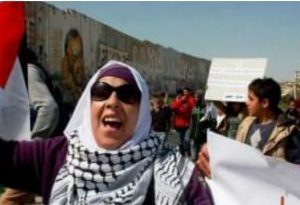 Israeli soldiers resorted, Wednesday, to the excessive use of force against dozens of women, and several men, who nonviolently marched near Qalandia terminal, north of occupied East Jerusalem, marking International Women’s Day. Palestinian medical sources said at least eight women suffered the severe effects of teargas inhalation and received the urgently needed treatment. The Palestinians said the procession’s location at the Qalandia Terminal, came to affirm the Palestinian rejection to the illegal U.S. stance and its recognition of the occupied city as the unified capital of Israel, and to affirm that the Palestinian people will never abandon their legitimate, internationally guaranteed rights of independence. They marched near the terminal, carrying Palestinian flags and chanting for liberation and independence, before the soldiers fired a barrage of gas bombs at them, causing eight women to suffer the effects of teargas inhalation. The soldiers also deliberately fired gas bombs and concussion grenades at Palestinian journalists in an attempt to prevent them from documenting the unfolding events. Intisar al-Wazir, the secretary-general of the General Union of Palestinian Women, said the location of the procession at the Qalandia terminal which leads to occupied Jerusalem, represents the legitimate Palestinian rights to achieve liberation, and establish an independent Palestinian state, with East Jerusalem as its capital. Israeli soldiers injured, Wednesday, many Palestinians who were marching peacefully against the illegal Israeli occupation, and in celebration of International Women’s Day. 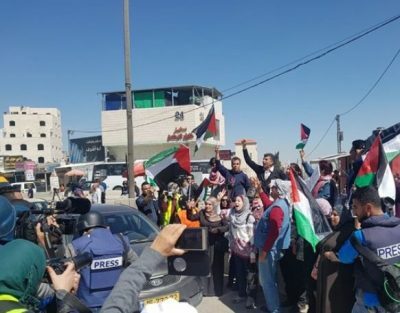 The Palestinians started the peaceful procession in front of Qalandia refugee camp, north of Jerusalem, where dozens of women and men marched towards the Qalandia terminal. Almost instantly after the protesters reached an area close to the terminal, the soldiers started firing a barrage of gas bombs and concussion grenades. Medical sources said dozens of Palestinians suffered the effects of teargas inhalation and received the needed treatment.